Cambridge, Wisconsin. 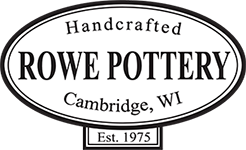 Rowe Pottery was established in 1975 as a two-person pottery studio and shop. All pottery was made by hand on the potter's wheel and the pots were fired in the brick kiln out behind the small workshop. The product line changed in early 1980 to focus on collecting antique cobalt blue decorated salt glaze crocks and jugs, which was a growing market in ceramics. Today, Rowe Pottery Works still makes the ever-popular salt glaze stoneware in addition to several other styles of pottery. Many items can be personalized or custom-ordered to make the perfect gift.